When Rap Spoke Straight to God is a raucous and irreverent book-length poem that refuses to sit still. Erica Dawson, author of two previous award-winning collections of poetry, turns her keen sense of form toward the poetic epic. Her poem, told in four parts, explores existence as a WOC in a deeply flawed and dangerous world. She speaks of the divine and the mundane in the same breath: “I tell Lil’ Kim that nothing makes / this woman feel better than telling God, / See my slow goddess and my two / fists, same size as my beating heart. / Same fists, the size of my stomach.” This fluent twining of opposites occurs throughout the collection: new and old, light and dark, divine and embodied. One of the most compelling dualities is her use of form. Her considered and formally astounding poetics are deeply aware of formalism’s fraught history as a bulwark of the traditional literary canon, which excludes POC like her. As a response, Dawson packs her formal poetics with meaning: “When Jeezy said Jesus said	the sky’s / our only limit, rap asked God who deferred / it to the dirt interred around the incus / the anvil of our ear’s middle passage.” Combining old and new iterations of biblical figures, abstract ideas and intimate bodily details, and the timeless dichotomy of earth and sky, she constructs verse heavy with history, from the “deferred” of Langston Hughes to the “middle passage” of the slave trade. Dawson engages with contemporary issues plaguing our culture, from #MeToo to the resurfacing of simmering racial hatred. When Rap Spoke Straight to God is a complex and transcendent response to our dangerous era. “If she was not a woman,” says the wind of Gbessa, a girl who can revive herself after dying, “she would be king.” The complex origins of Liberia, the first African settlement for emancipated African-Americans, forms the backbone of Wayétu Moore’s powerful debut. The narrative focuses on three characters and their unexplained powers: Gbessa, a young indigenous Liberian exiled from her village on suspicion of witchcraft; June Dey, an inhumanly strong runaway slave from Virginia; and Norman Aragon, the son of a white British colonizer and a Maroon slave from Jamaica who inherited the power of invisibility from his mother. The three meet in the settlement camp of Monrovia, where they use their gifts to help temper the tense relationship between the settlers and the native peoples. Moore’s use of magical realism fits aptly into the proto-mythic atmosphere of a country coming into being amid the realities of African diaspora. The wind often interjects as a combination of narrator and chorus, animating the African landscape that shelters the characters. The settlers’ fraught relationship with the peoples indigenous to Liberia casts a welcome light on the complexities of African culture and life. Moore’s novel, most of all, constructs an African narrative that is not focused on war, poverty, or a simplified village life. 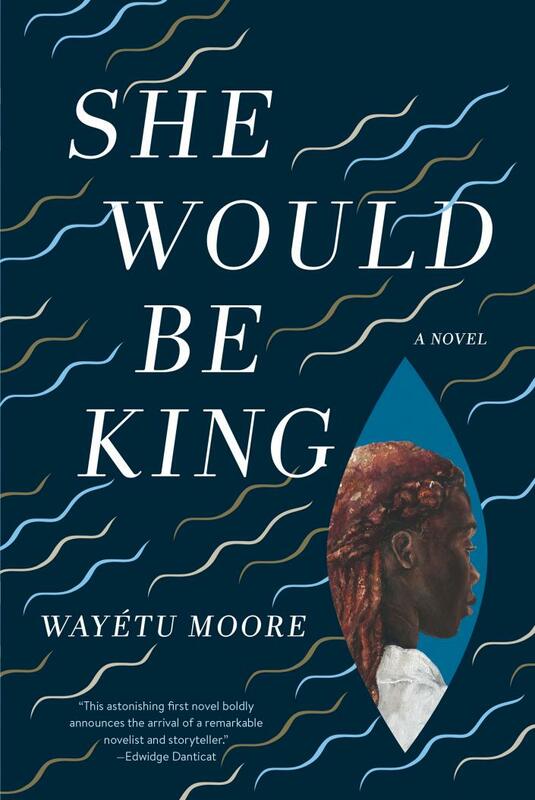 She Would Be King explores universal themes of ethics, familial expectations, and unexpected passions in the midst of a new nation settling itself among existing African societies.